You'll be £19.99 closer to your next £10.00 credit when you purchase I Escape!. What's this? Of all the daring PoW escape stories that have come to light in the last 100 years and immortalized by Steve McQueen in the film The Great Escape, the story of J.L. Hardy has to be one of the most remarkable. 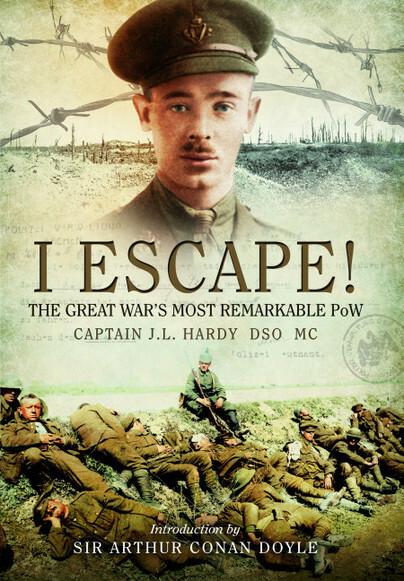 A PoW for three-and-a-half years, Hardy made no less than twelve escape attempts while imprisoned by the Germans in the First World War, five of which being successful. In early 1915 he attempted to escape from Halle Camp, near Leipzig, by breaking through a brick wall into an adjacent ammunition factory. After five-months work the project proved impracticable. In the summer of 1915 he was transferred to Augustabad Camp, near Neu Brandenburg, and after being there 10 days he managed to slip away from a bathing party outside the camp, together with a Russian officer. After a difficult journey they covered the 50 miles to the Baltic coast. They swam a river, were nearly recaptured once, but eventually reached Stralsund. They nearly managed to get the crew of a Swedish schooner there to give them passage, but were arrested at the last moment. Hardy was returned to Halle and joined an unsuccessful attempt with a group of Russian officers to break down a wall. He then made a solo escape attempt by picking locks and breaking through a skylight before sliding down a rope onto the street. From here he slipped into the rain and darkness. He spoke enough German to make his way by train to Bremen. Here, broken down by cold and hunger, the Germans recaptured him. He was then transferred to Magdeburg, where he escaped with a Belgian officer using "subterfuge, audacity and good fortune". They reached Berlin by train, and went on to Stralsund. From there they crossed to the island of Rugen, but were arrested before they could find a fishing boat to take them to Sweden. His next prisoner of war camp was Fort Zorndorf, from where escape was virtually impossible. Nevertheless he made several attempts, and one nearly succeeded when, with two others, he almost got out disguised as a German soldier. Hardy was transferred around further and made subsequent escape attempts until he finally managed to escape for good in March 1918, after being a PoW for over three-and-a-half years. Written in Hardy's own words, this book reads like a wartime thriller or Hollywood screenplay and his Great War story makes for fascinating reading. As thrilling as any novel of adventure. It is a simple straight forward story wholly deserving of the eulogistic forward written by Sir Arthur Conan Doyle.